2. How do I start creating an animation? 3. How do I export an animation? 1. Slide controls. Each slide in DP Animation Maker is a picture with its own animation effects. On the left you can edit the project slide list, exposure timings and camera settings. Animations of the active slide can be configured on the right. 2. Animation controls. Here you can add and edit animations for the active slide. Most animated objects and effects have a wide range of parameters located on the tabs below the list of animations. 3. Real-time preview. Each change you make in the project will be immediately previewed in the central area. Also some animations allow you to interactively edit their parameters (like position and size) right in the preview area. 4. Time-line controls. Most of the animations allow you to set the timings of their exposures. Look at this article for details. How do I start creating an animation? To start your first animation, use the tool bar on the top of the preview area. Load any picture using the "Change Background" button. Then add animations using the "Add Animation" button. You can add as many animations from the list as you want. 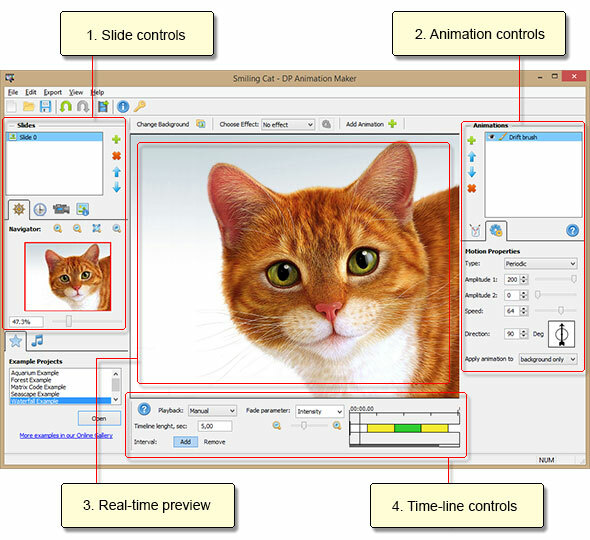 You can also import your own animation in GIF and PNG formats. The parameters of each animation can be adjusted using the controls on the left. How do I export an animation? When your animation is ready, it is time to save it. First click the Export button on the program tool bar. It will open the dialog with the list of all supported output formats. Select a format and proceed with the rest of the export procedure. 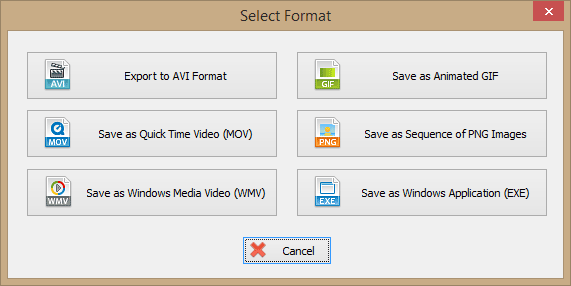 AVI - A common video format. You will need to select one of the DirectShow codecs installed on the computer for compressing the video output. The size and quality of the final video file will depend on this selected codec. It is not recommended to use codecs without compression. MOV - The QuickTime file format. Provides lossless video quality and alpha-channel support at the cost of large file size. Suitable for importing from DP Animation Maker into other video or animation projects. WMV - The Windows Media Video format. The format is still used in some applications even though it provides mediocre quality and compression level. GIF - The old graphics format. Supports only 256 colors and 1-bit transparency mask. Mostly used for web animations. Exporting in this format will dramatically reduce the animation quality. Also it is not recommended to save long and large animations in this format. PNG - Portable Network Graphics. Provides lossless picture quality and alpha-channel support. Suitable for importing from DP Animation Maker into game and animation projects. EXE - Standalone Windows application. It is a file that can be run on any computer and will play continuous animation without looping and brakes.